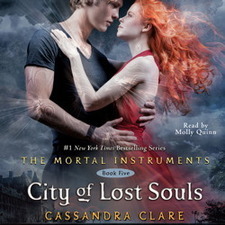 The 5th book of the Mortal Instruments series, and to me it was on the same level as the rest of the books in the series, with the exception of City of Glass which was much much better. The story line of this instalment was pretty good, it had a good mix of love and action and drama and humour. But as with the rest of the Mortal Instruments books I just find it to be lacking something. I definitely enjoy these books, however, it's not one of my favourite series. I found Clary and Jace to be just as annoying in this book as I have in the rest of the books. They just need to get it together already! I really enjoyed the development of Simon and Isabelle in this book however! I enjoy both of their characters far more than I do Clary and Jace. There were parts in this book where I was unsure of whether or not I liked/trusted Sebastian, there was a few chapters where I actually started to like him! I am still undecided! Alec was very annoying throughout a lot of this book in his relationship with Magnus. He kept getting mad at Magnus for having a past and for dating others before him... Obviously he has been in love before and dated others he is hundreds of years old! Alec is a big baby. This next part may be a SPOILER, so be warned! What is it with Cassandra Clare and having siblings love each other inappropriately??? Or did I misinterpret Sebastian's feelings toward Clary? That could also be possible! But enough is enough, I don't enjoy reading about how brothers and sisters are in love with each other ha its just icky! I was also kind of glad that Magnus left Alec, good for him! Alec was way out of line even thinking about taking away Magnus' immortality, I don't care how much he loves him, that wasn't a decision for him to make, for very very selfish reasons. Overall I enjoyed this book, but like I said before, just not one of my favourites series, City of Glass has been the only one that has really stood out to me, but definitely a good series, and this book was one of the better ones!